A report released today is calling on the Ontario Association of Children’s Aid Societies to work with Indigenous and African Canadian communities to identify and address systemic racism that sees their children taken into care at disproportionate rates. It is one of 32 recommendations that stemmed from a two-year independent commission that looked at the “broad harm” caused by Ontario’s Motherisk program, which tested strands of hair from parents for drug and alcohol use, and then used faulty results in court to remove children from their families. More than 16,000 individuals were tested for child protection purposes. The program was shut down in April 2015. The Motherisk program was “imposed on people, who were among the poorest and most vulnerable members of our society,” wrote Commissioner Judith C. Beaman in her report. Testing was done with little regard to privacy rights or bodily integrity and presented with a narrow scope of interpretation to the courts, where abstinence was a necessity. The commission reviewed 1,271 cases, with “every effort” made to review those in which children were permanently removed from their homes and were still under the age of 18. Of those reviewed, 14.9 per cent involved Indigenous families. Of the 56 families, in which the “test results had a substantial impact,” wrote Beaman, seven cases or 12.5 per cent were Indigenous families. According to the 2016 census, Indigenous peoples account for 2.8 per cent of Ontario’s population. Beaman also called for the federal government to immediately provide adequate funding to First Nations for band representation in child protection proceedings as well as the Ontario government to support the ongoing training needs of bands to participate in the proceedings. The commission is recommending more stringent rules when it comes to the use of expert evidence and expert reports in court for child protection hearings, following the first court appearance. The commission took to task the court’s focus on “expert evidence” of bodily samples. Recommendations called for child protection workers to get valid written consent from parents for bodily samples and for the courts to ensure that consent. As well, if a parent didn’t consent, that was not to be viewed by the court as a parent’s admission to drug or alcohol use. In considering expert evidence, the commission recommended that the court assess the necessity for and reliability of that evidence through a voir dire – a trial within a trial – before admitting that evidence in a child protection proceeding. 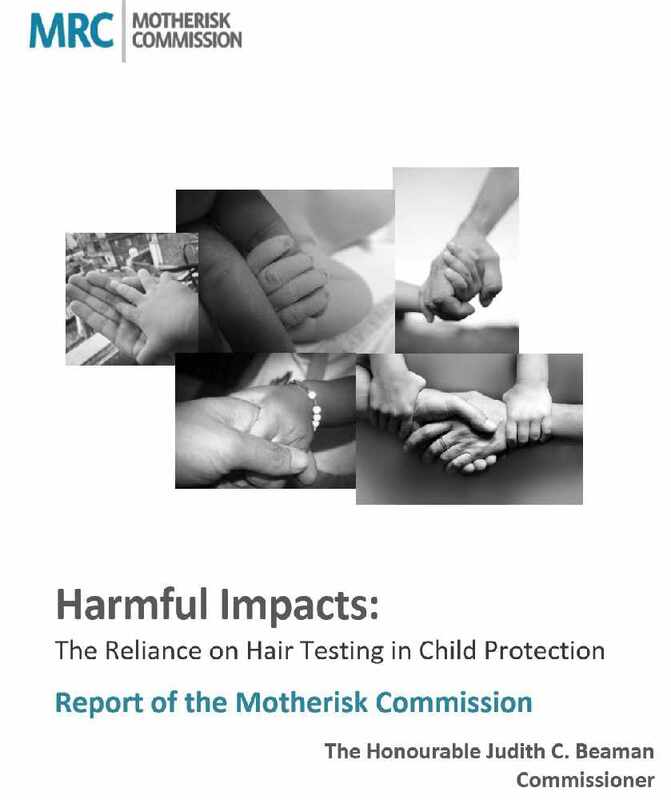 Beaman wrote that while she understood the additional funding needed for the recommendations and the additional pressure it would put on “already busy child protection and legal systems,” it was “vital given the harm the Motherisk hair testing caused to families and the damage it did to the credibility” of the child protection and legal systems. After conducting its review of the cases, the commission contacted all the families – both biological and adoptive – that were substantially impacted by Motherisk testing. Letters explaining the commission’s role and the impact of Motherisk testing was given to case workers to place in the files of the children involved. Children will have access to those letters should they choose to view their files in the future. The commission also offered legal referrals to people substantially impacted by Motherisk testing. Legal options varied and so did the chances of biological parents getting their children back. The commission also provided referrals to counselling services although Beaman noted that not only was it difficult to get in touch with everyone impacted by the program, but those they were able to contact said it was a “painful” issue to deal with. She wrote, “People often told us that their involvement with the child protection system had been traumatic and they did not want to reopen that chapter of their lives.” Coinciding with its two-year mandate, the commission covered two years of counselling services. However, the commission has recommended an additional three years of counselling services. Other recommendations include education on substance use and impact on parenting; substance use treatment programs; child welfare education for social workers, law students and adult protection lawyers; and the establishment of parent and youth advisory committees, a stakeholder advisory committee, and an annual child protection summit.